In December Brenda and I joined Joe and MaryAnn McDonlad plus three other participants for a two week wildlife tour of some of the Falkland Islands hotspots. The Falklands is a bucket-list destination for birders and bird photographers. There are 5 species of penguins plus elephant seals, sea lions and many other song birds. Many of the animals display Galapagos-like fearlessness, allowing close approaches, when done with patience and care. It’s been said that one does not need big glass for the bird photography but I brought my 600 Nikkor and used it a lot. It was heavy to carry to some of the colonies but not unbearable and it allowed me to capture tight portraits and bring in the smaller songbirds when necessary. The flexibility and lighter weight of a 150-600 could be an alternative but I have not yet compared such a lens to the 600 for sharpness and contrast. The tour began in Stanley with a day trip to Volunteer Point, site of the largest king penguin colony in the Falklands, followed by a day trip to the less visited Cape Bougainville for macaroni penguins, rockhopper penguins, sea lions and king cormorants. Since we were in the Southern Hemisphere’s summer months the sun rose around 4:30 a.m. and set about 9:30 p.m. Late December brought long days and plenty of light. The Falklands are very British, bleak and windswept, perhaps similar to the British moorlands. Sheep farming is the dominant industry but tourism is important too, along with other ventures. The terrain is treeless with occasional rock outcrops and the dominant grass is called white grass, whose colour tends to mask the summer greens, furthering the appearance of bleakness. But the terrain is undulating and dotted with small ponds and crossed by occasional streams. Our inter-island FIGAS flights gave us excellent views of the island landscapes. We had about 4 hours with the animals at Volunteer Point but it was a very satisfying start. Joe and MaryAnn advised us to concentrate on the kings but how could you pass up the gentoos feeding their newborn chicks? Impossible. For the second time in three years Brenda and I travelled to Las Vegas to watch international curling- the Continental Cup of Curling that pits 6 North American teams against 6 World teams over the course of 4 days. It’s similar to a Ryder Cup/President’s Cup (golf) in this case featuring Olympic level teams at the Orleans Arena. Driving that far, I decided to combine the Vegas visit with some winter photography in State and National Parks nearby. There are 5 famous National Parks in the state of Utah. We towed our trailer with the intention of camping in parks like Zion and Capitol Reef which keep campgrpunds open during the winter. I was under no illusion that it could be cold and snowy and this year’s El Nino seemed to ensure that notion by amplifying winter in that part of the continent. Ontario, on the other hand, was experiencing a mild winter- the first first brown Christmas I have experienced in a long time, but the west seemed to be getting its share of snow and cold temperatures. As a photographer I was looking forward to seeing the fabled red rock canyonlands of Utah with snow and winter conditions. 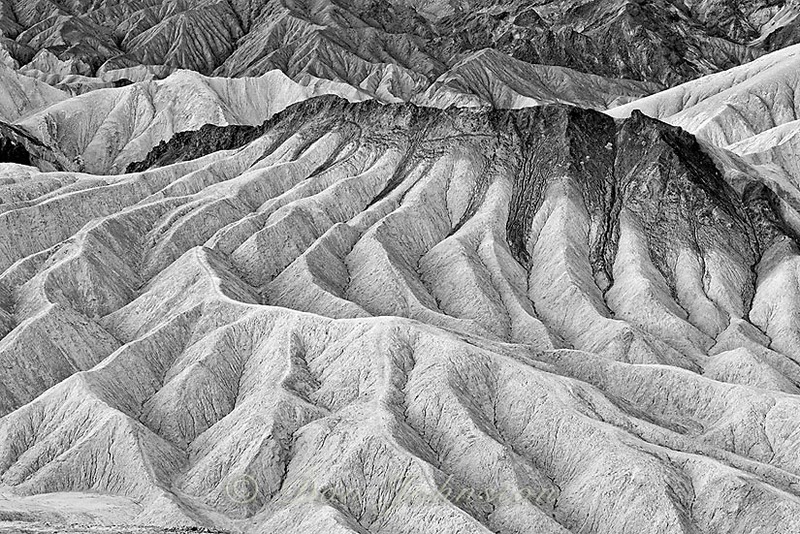 After all, it is a high desert, with little precipitation and the region has been photographed extensivley over the years during the more tourist friendly seasons, so I was hoping for some unique images. It was our first visit in twenty five years (!) and I was not disappointed. 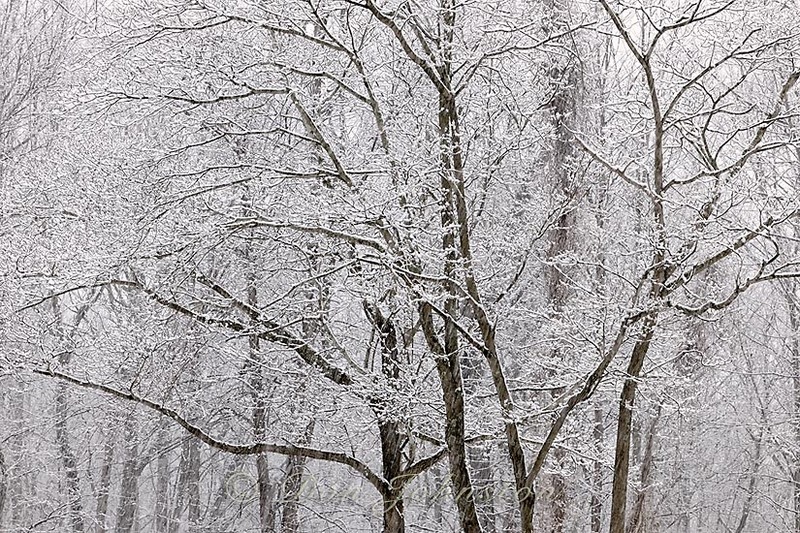 Arches, Canyonlands, Bryce, Zion and Capitol Reef were blanketed with fresh or recent snowfalls. Some of the trails and viewpoints were icy and slippery but a pair of slip on ice grips made the footing safer. The snow and cold temperatures drove us into motels at times especially at Bryce Canyon when one of California’s winter storms moved east and dumped about 40 cm of fresh snow, driven by a howling wind. At its peak the weather resembled the worst of what we can get in January in Northern Ontario. But the roads are well maintained in Utah. The only exception was the main park road in Bryce, closed temporaily past the first couple of viewpoints. The park service did an excellent job under the prevailing conditions, maintaining the road in to Sunset Point and even snow-blowing the viewpoint paths. The Big 5 National Parks of Utah were not our only ports of call. 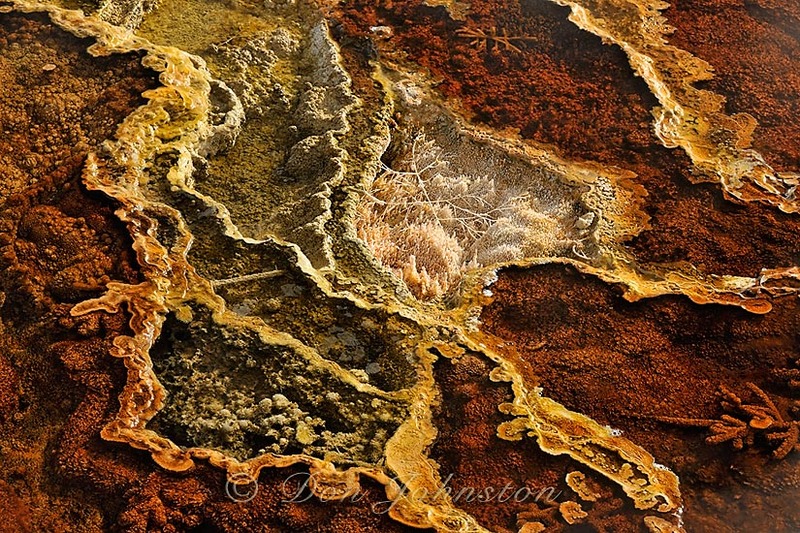 For more images of the parks and other locales in the Grand Staircase please visit these galleries on my 500px site. 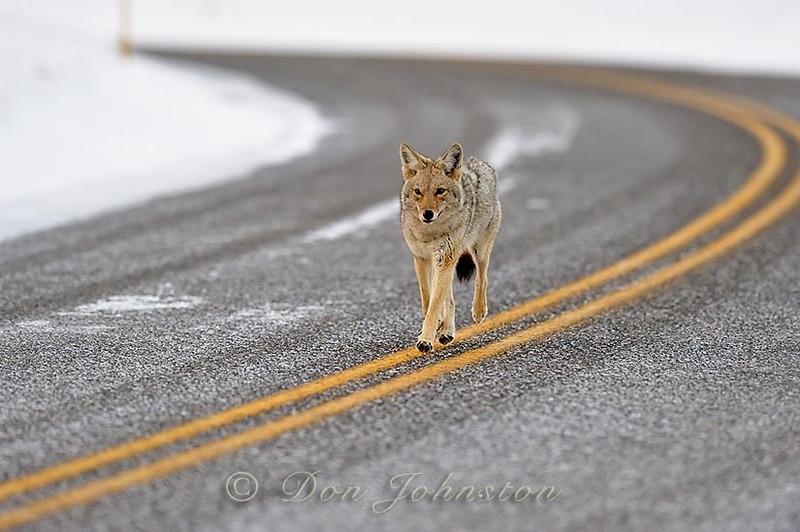 https://500px.com/don_johnston/galleries/utah-s-big-five-in-winter and https://500px.com/don_johnston/galleries/red-rock-country-winter-2016. Thanks for reading! Please share with others. 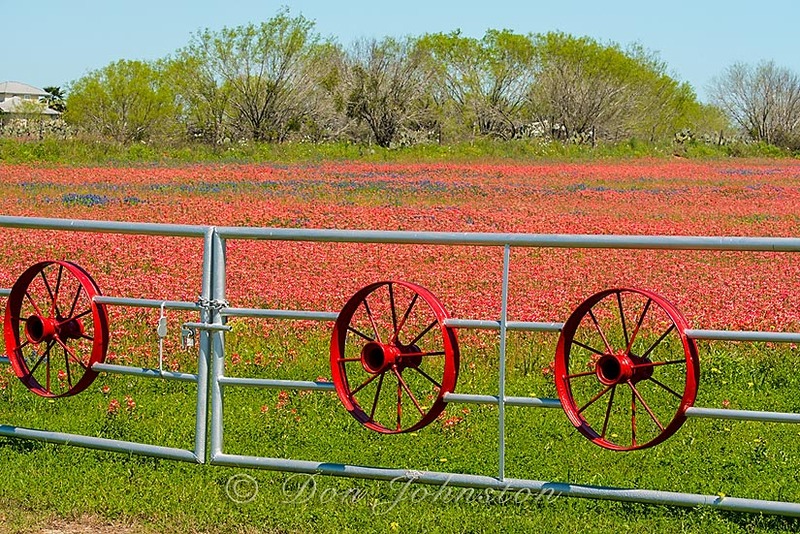 Brenda and I are spending over a month in the Hill Country of Texas during the latter part of March through April. We planned our trip to coincide with the spring wildflower bloom. 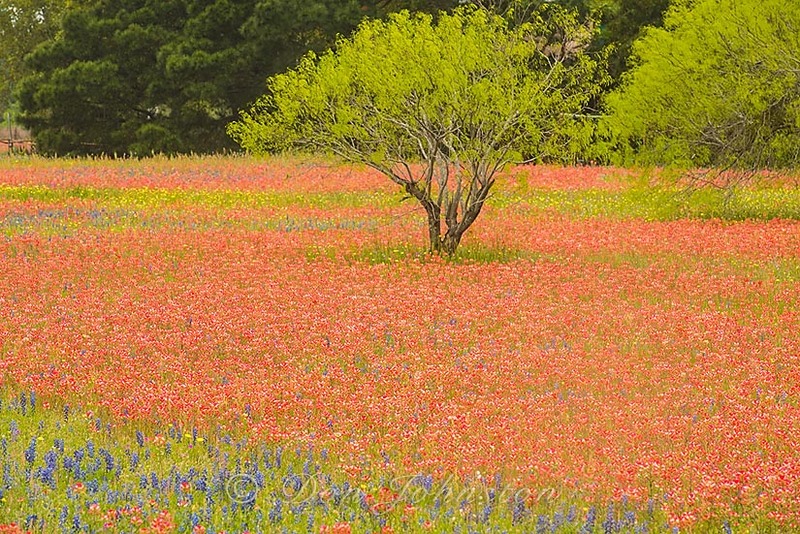 Texas wildflowers: legendary, diverse, vast expanses of colour ranging from orange, magenta, blue, yellow and red. 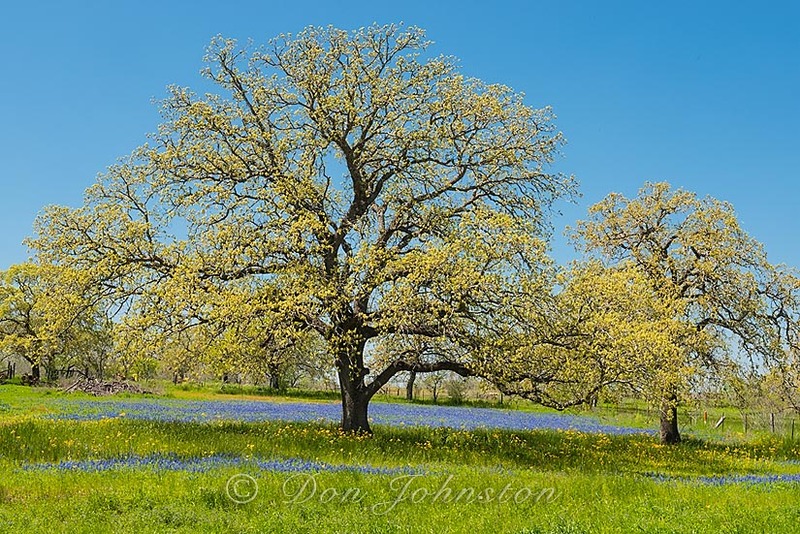 The rainfall patterns in fall and winter are important factors that determine the quality of the spring bloom and we are fortunate this year to have had sufficient precipitation to promise an above average bloom. I feel fortunate, especially after experiencing the brutal winter in Northern Ontario this year. 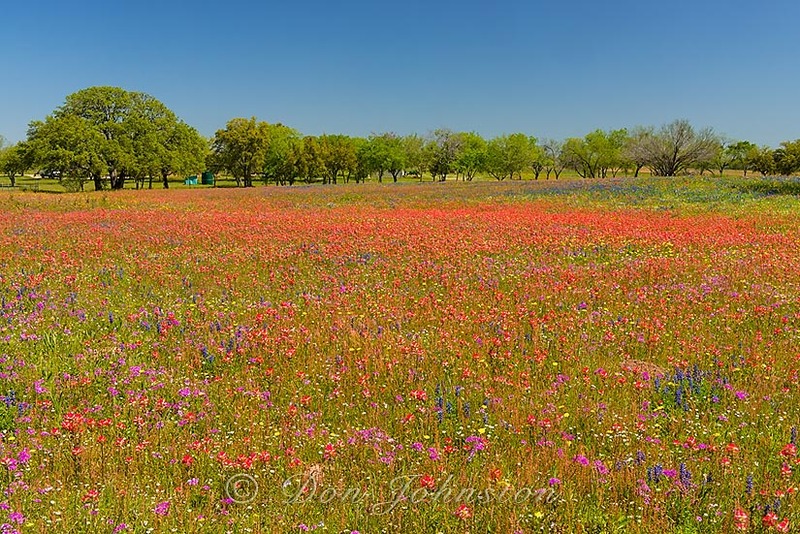 Texas has been in a protracted drought in recent years and the wildflower bloom has been less than optimum these past few years, the last good year occurring in 2010, according to noted wildflower photographer Gary Regner who lives in this area. 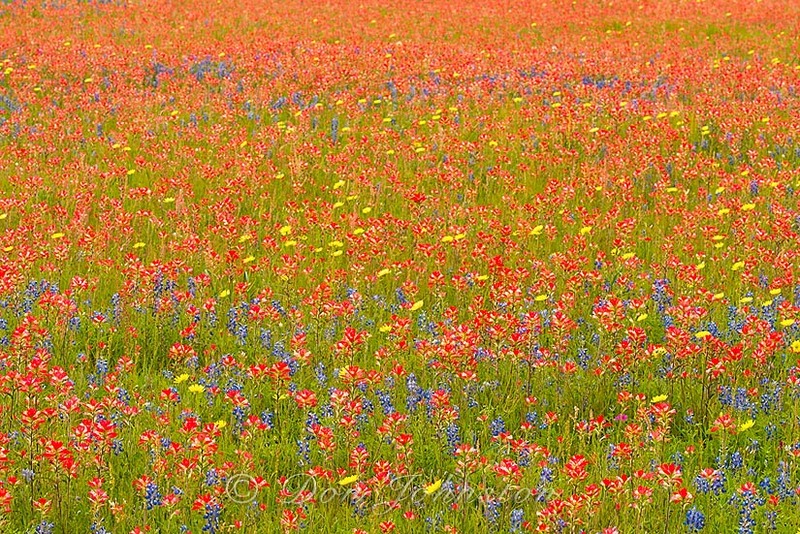 Gary’s website and blog http://www.texaswildflowerpictures.com/update.htm is a great source of information and updates for the visiting photographer. The pictures I present at this point have been harvested from areas south of San Antonio. 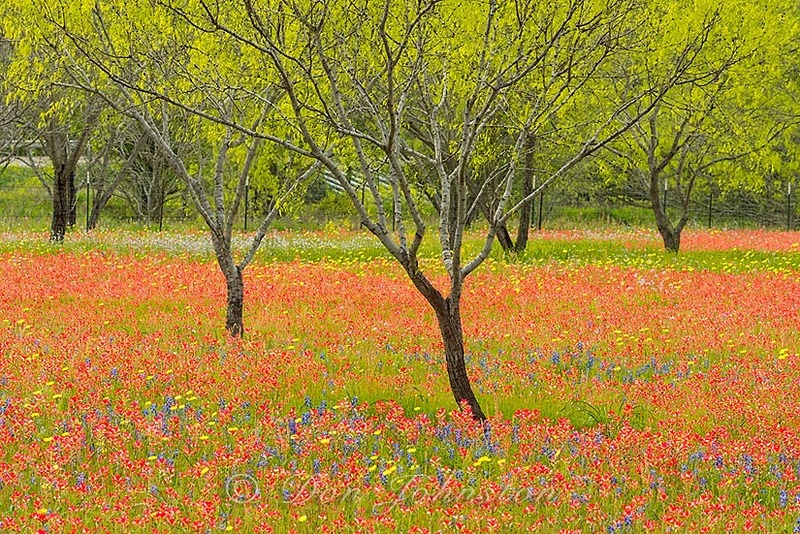 We are still awaiting the full bloom in the Hill Country around Austin, Johnson City and Marble Falls but patches of colour are appearing every day as March slides into April with an expectation of a mid April peak. 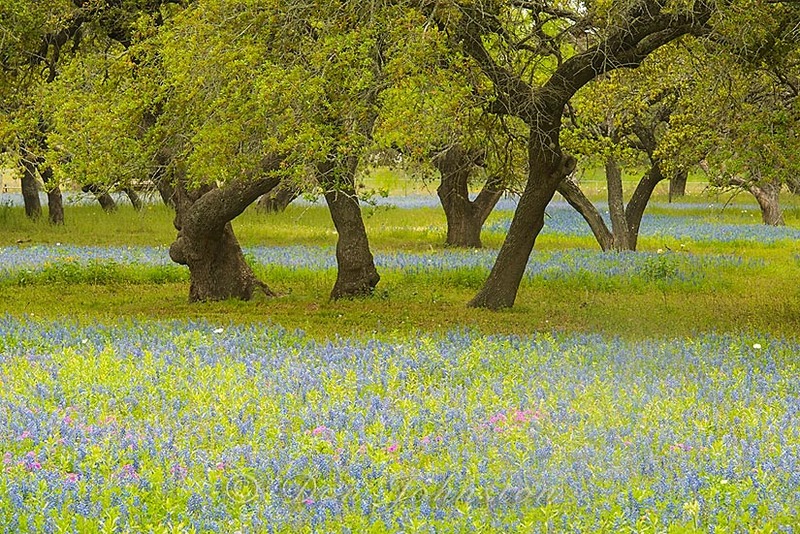 The areas south of San Antonio are flatter with pastures and farmland dominating the scene. 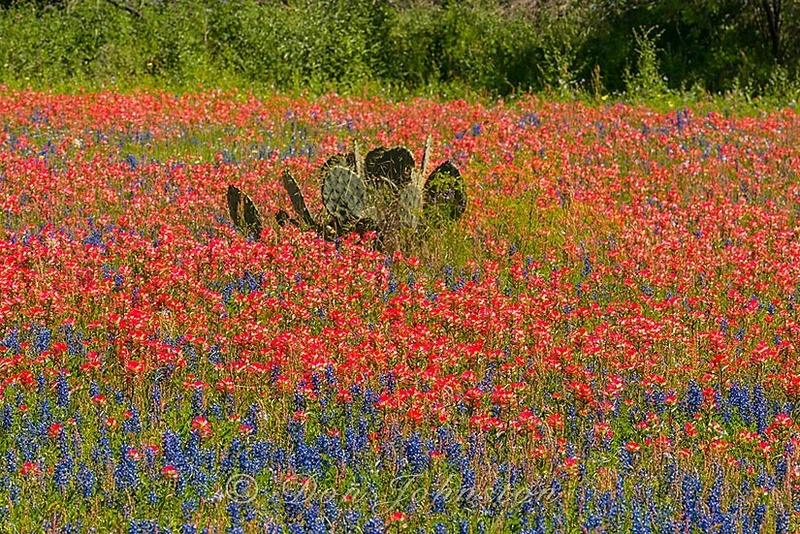 Travelling the country roads we find flowers in the roadside and in the fields beyond. When the sky is clear I can include the blue sky. When the light is soft and overcast I try to exclude the white sky, concentrating on more intimate scenes. Focus stacking technique is sometimes necessary to extend the range of sharpness near to far in these flat landscapes. The traffic at times is fearsome, especially on the major highways around Austin and San Antonio but the smaller side roads are well maintained, less heavily travelled with wide shoulders for safe pull-offs. With careful planning it has been possible to use secondary routes to avoid the bumper-to-bumper traffic in and out of the big cities. 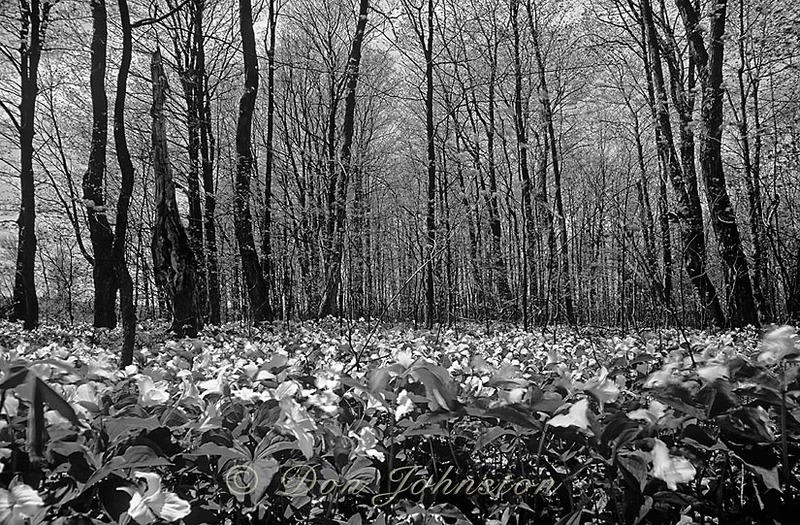 I will preface my comments by admitting that while I enjoy black and white photographs I have never made any images on B&W film nor have I spent any time mastering B&W software techniques. So this indeed is an offering made by a ‘newbie’ to the greyscale game. That being said, B&W software is fairly easy to use, whether it is embedded in a Raw processor or is a third party stand-alone plug-in. I chose the Photoshop third party route, using Perfect Photo Suite by onOne Software. I found it easy to use, offering a robust set of features and adjustments together with pre-sets. I did not use any pre-sets for this assignment although there are plenty from which to choose. My main goal was to select images with good contrast that would feature elements of visual design, such as perspective, line, shape and texture, all created with variations of tonal contrast. I tried to retain shadow and highlight detail and I tried to select from a variety of subjects from my files, both close to home and abroad, landscape, abstract and wildlife. These first five images in this gallery represent my selects, followed by a short slide show of also-rans. What’s your favourite? Would you have chosen any from the ‘also-ran’ list to take the place of my 5-day picks? Greetings dear readers. Apologies for once again neglecting the blog. Brenda and I have been travelling extensively this past year and some things like the blog have been placed on the back burner. The good news is that I will have a lot of new material to write about and post pictures about. Photo adventures in South Texas and Arkansas, Smokies (Autumn), Nevada, California and the Galapagos Islands should provide fodder for future posts. I’ll be spending much of this summer editing and catching up on the huge backlog of recent material. This entry is about making photographs in unlikely places such as Interstate Rest Stops. 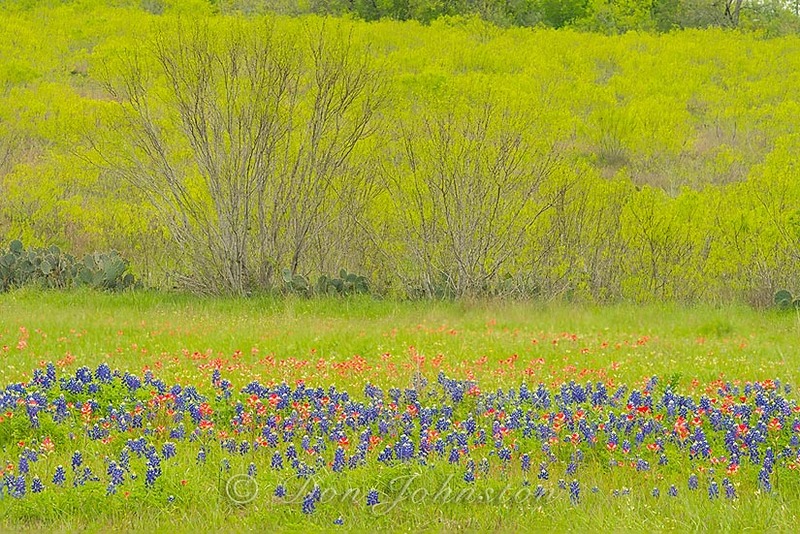 Brenda and I will shortly be travelling to Arkansas and Texas for spring scenery and birds. We usually travel to our US destinations via the Interstate highway system. Occasionally we will drive secondary roads if there is a possibility we are missing something on the way. The Interstate Highway system is a fast, efficient and reasonably safe means of getting from Point A to B. Interstates can be boring from a photographic standpoint, although some, like I70 (in Utah) pass through jaw dropping landscapes. Interstates generally prohibit stopping, unless there is an emergency. I don’t think a state trooper would be amused if I tried to explain that my emergency stop was for taking a picture. 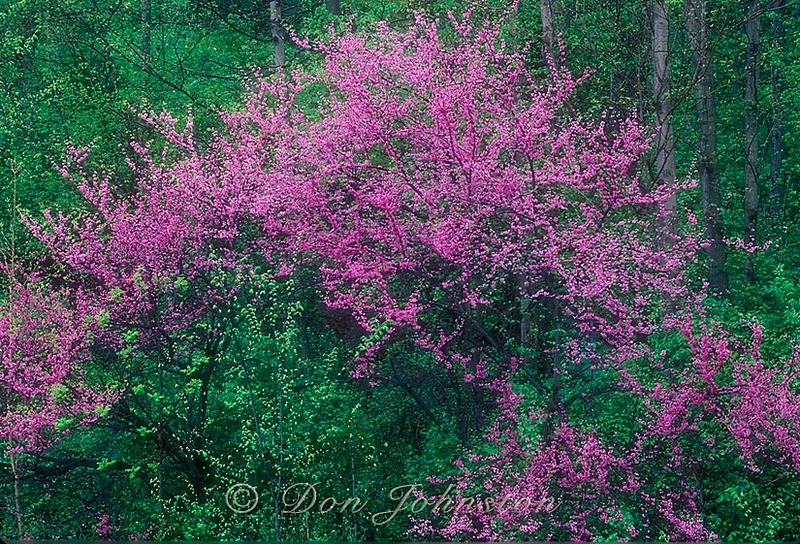 While driving to the Smokies in springtime it became apparent that the best redbud in bloom would be found well north, in this case at an I75 Ohio Rest Stop. The system includes Rest Stops every 50 miles (80 km) or so and these are well maintained and convenient places to change drivers, go to the bathroom or have a bite to eat if weather is cooperating. There can be photo opportunities at rest stops. Often there is information describing something of historic or geographic significance in the area. Usually there is a picnic area and a place to exercise the dog and stretch one’s legs. One needs to set aside pre-conceived notions about these places and have the camera ready if opportunities arise. My tripod and camera bag are always accessible when we stop. 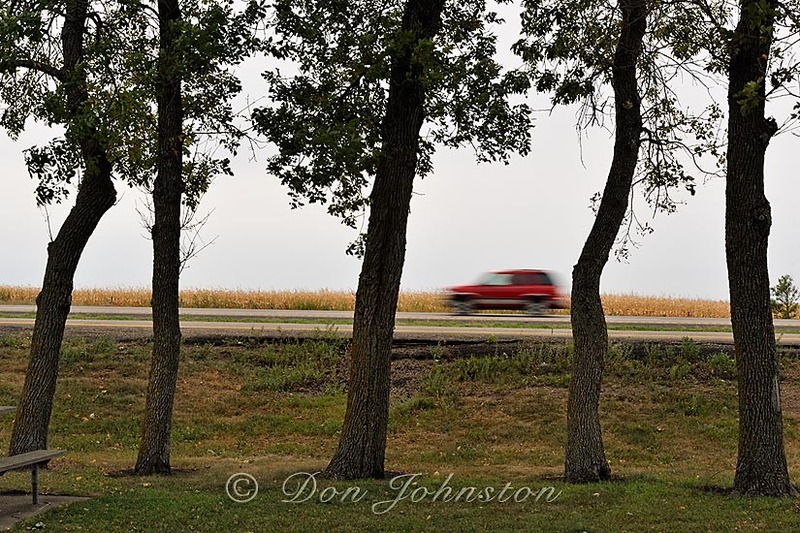 Here is a selection of other images I have made over the years at these Rest Stops. Please enjoy. 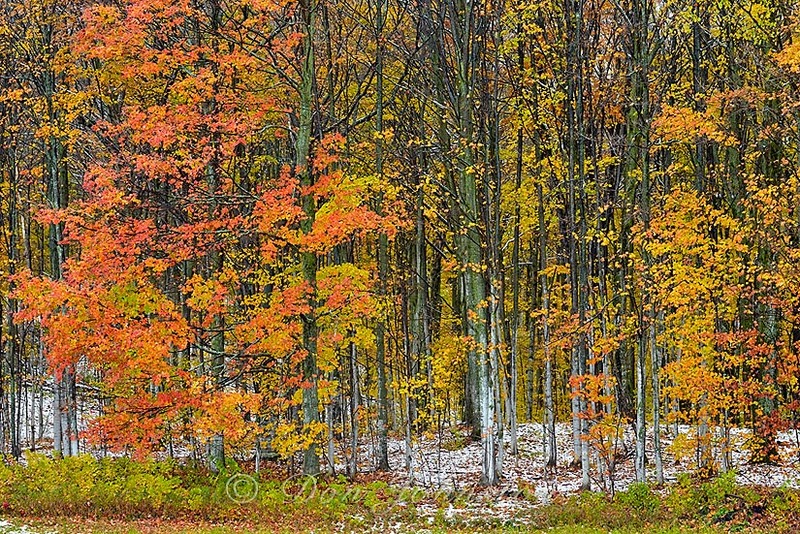 Late autumn colour and early snow in Michigan along I75. 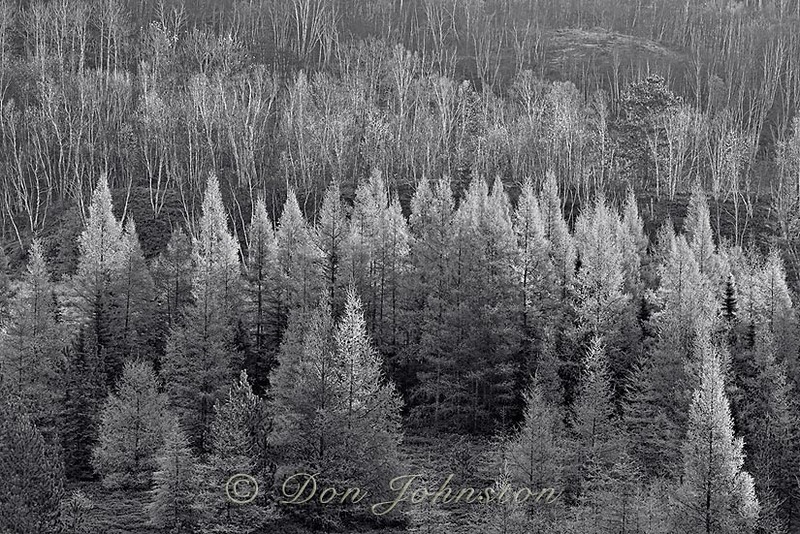 Frost for hundreds of km along I94 in North Dakota. Unfortunately it petered out before Roosevelt National Park was reached. The NC/SC state line rest stop proved to be a welcome respite from a late winter snow storm in the Carolinas. 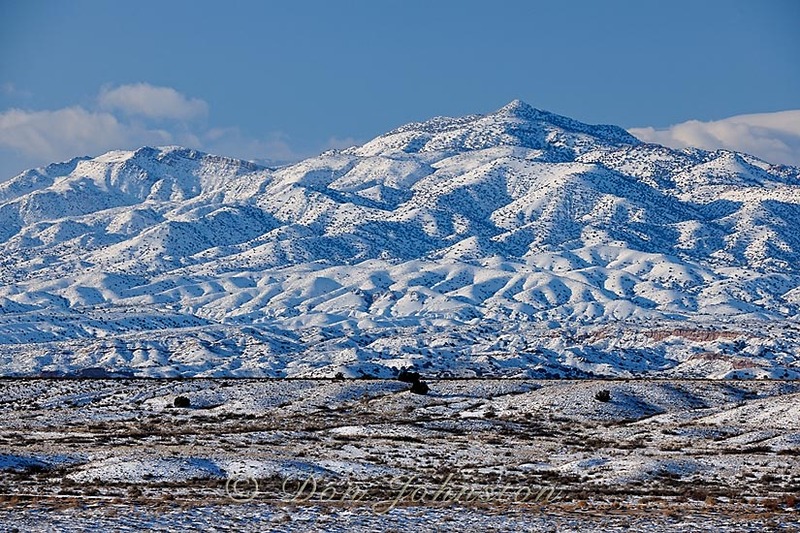 This I 25 Rest Stop was an ideal locale for photographing the fresh snow near the Rio Salado sand dunes in New Mexico. 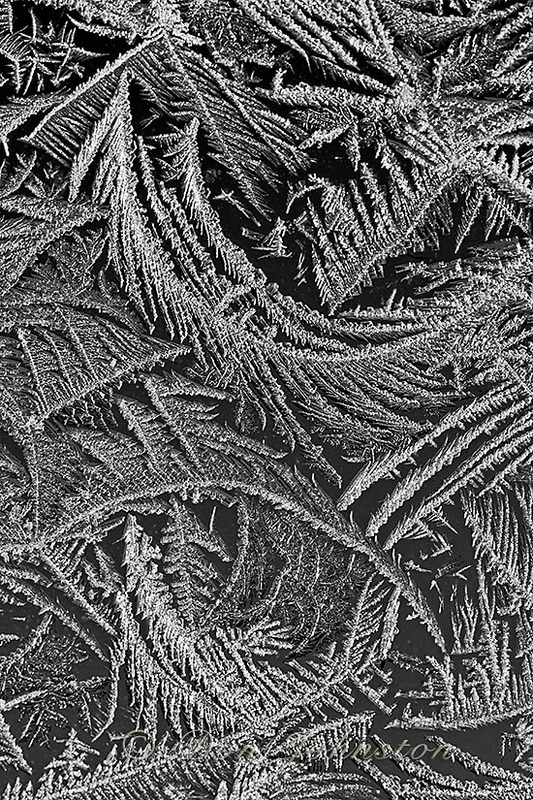 Yes, I know it’s summer and we are trying hard to forget winter, but I am always a few months behind in my image editing so here is a posting that re-visits the winter of 2012. 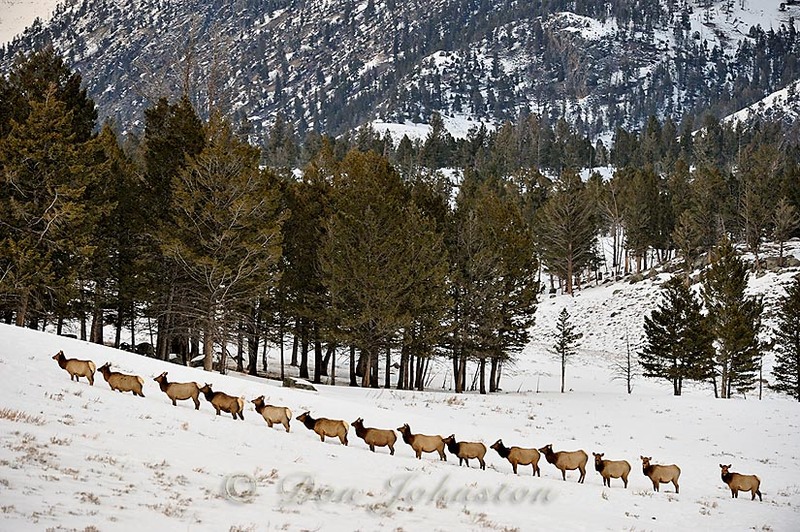 After five days of exciting and productive winter animal photography (blog post coming) at Animals of Montana near Bozeman in late February-early March Brenda and I drove to Gardiner for some winter photography along Yellowstone Park’s only open road. The 50-mile road from Gardiner’s Roosevelt entrance to Cooke City is maintained by the Park Service with plows and sanders to allow the residents of Cooke City access to Gardiner and beyond. While the road is well maintained it does have steep, slippery sections, especially in areas that do not have much exposure to the sun. Elsewhere, winds drift snow across the road, especially in the Columbia Blacktail Deer Plateau. Occasionally the drifts block a lane thus requiring attention from maintenance crews. Driving with winter tires is recommended. Some pull-outs are kept clear and many of these will be occupied by wildlife (wolf) watchers with spotting scopes. Winter visitors may also opt for snow-coach tours into the interior from Gardiner-Mammoth or from West Yellowstone. 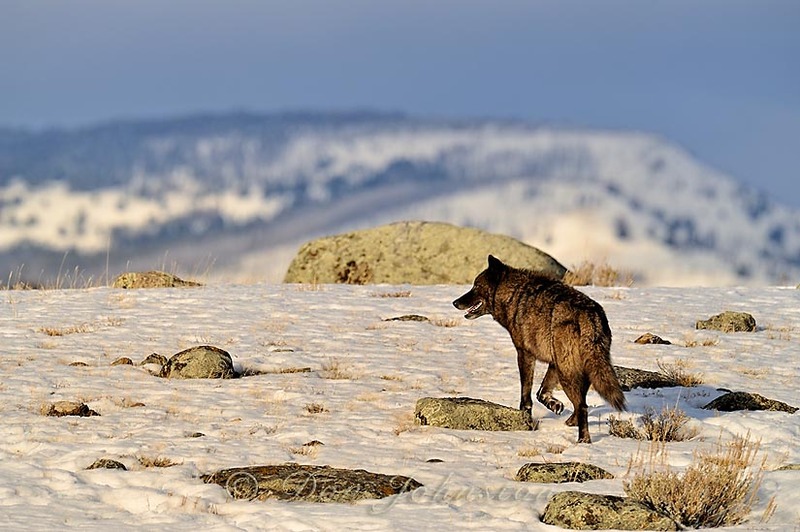 One of Yellowstone’s major animal attractions is the grey wolf, re-introduced to the ecosystem in the mid 90s. Casual visitors such as us have little opportunity for close encounters. Most of my sightings have been distant. We were lucky this time with two encounters at close range, one of which turned into a ‘grab-shot’ photo opportunity. The lone wolf crossed the road right in front of our vehicle and I had time to set up the long lens before it ambled off. Normally Park rules prohibit approaches closer than 100 yards, but in this case the wolf crossed the road right in front of our vehicle. Unexpected crossings like this emphasize the need to drive with care and be observant. It’s important to have a camera within reach and bean bag or window mount too. Of course we had to endure (with envy) the ‘you have been here yesterday’ comments from other visitors. Wolves had killed an elk in the Gardner River Valley. Coyotes, magpies and ravens were scavenging the carcass by the time we passed by. I regard myself as a generalist photographer. 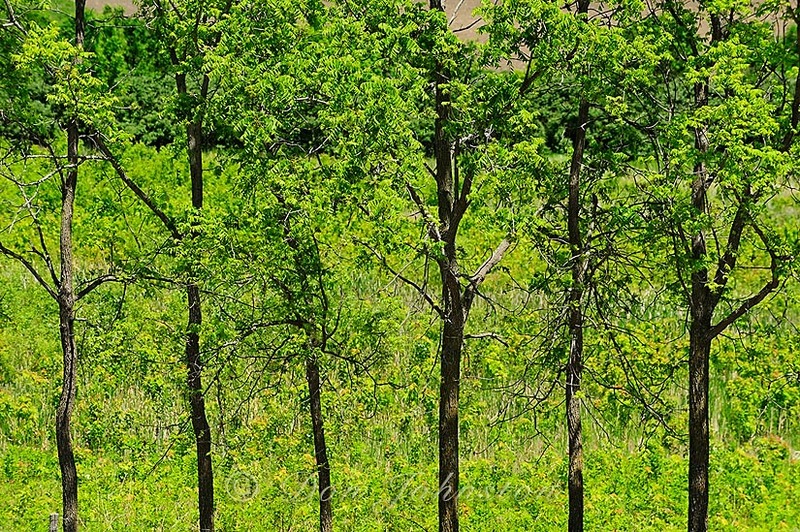 While I enjoy wildlife photography I don’t let it dominate my approach to seeing nature. 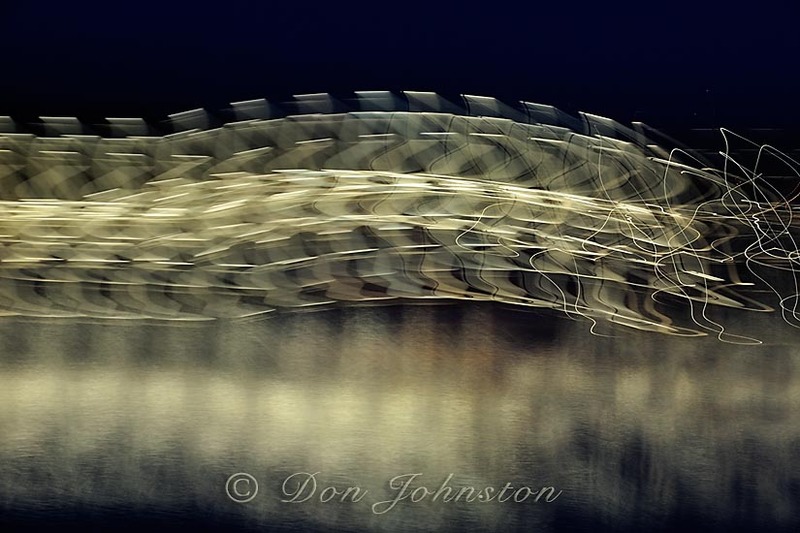 I am also attracted to landscapes, flora and abstract subjects. 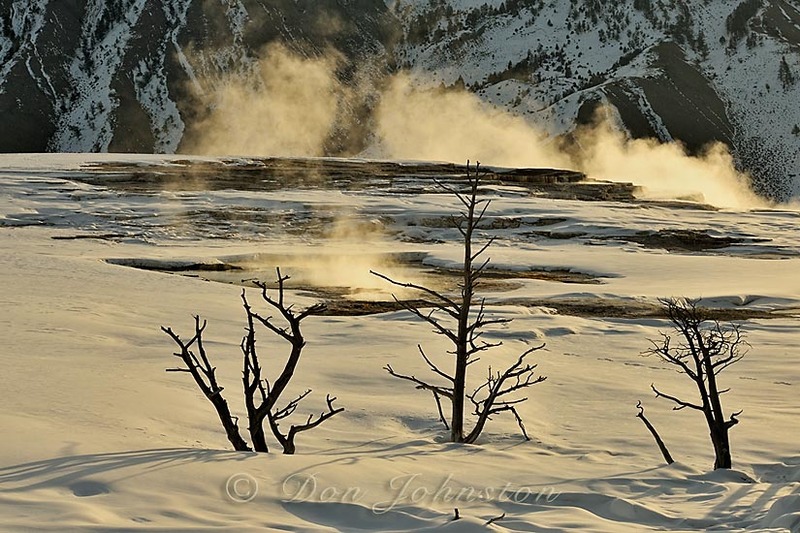 I try to balance my photography when I make short visits such as this to exotic locales like Yellowstone. It saves me from being disappointed at not seeing or photographing the ‘star species’ and often yields just as satisfying images. 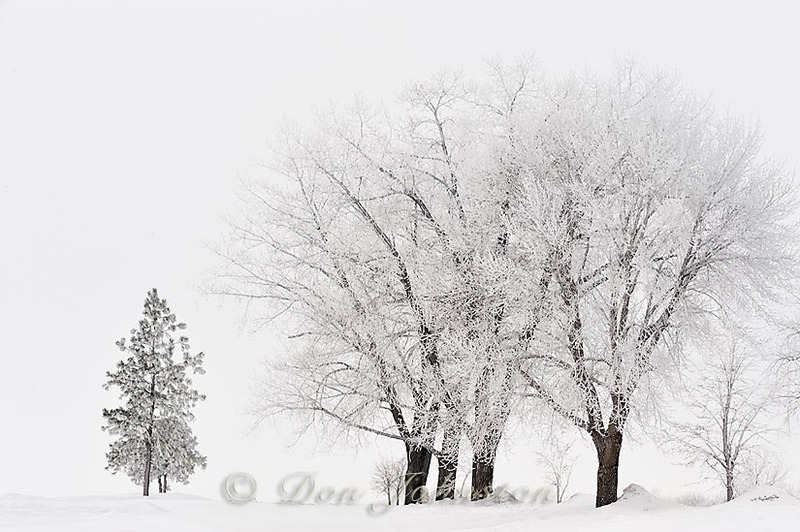 Even though 2011-12 had such a warm and unusual winter we were fortunate to have fresh snow in early March. Over four days we experienced variations in weather, from clear skies to near-whiteout snow squalls. Gardiner is not very busy at this time so motels were inexpensive and rooms were available, although we did reserve ahead. The Park closes winter operations into the interior by mid March and we were surprised to see that establishments like the Mammoth Hotel actually close up for a few weeks while interior roads are plowed and made ready for the spring tourist visitation. 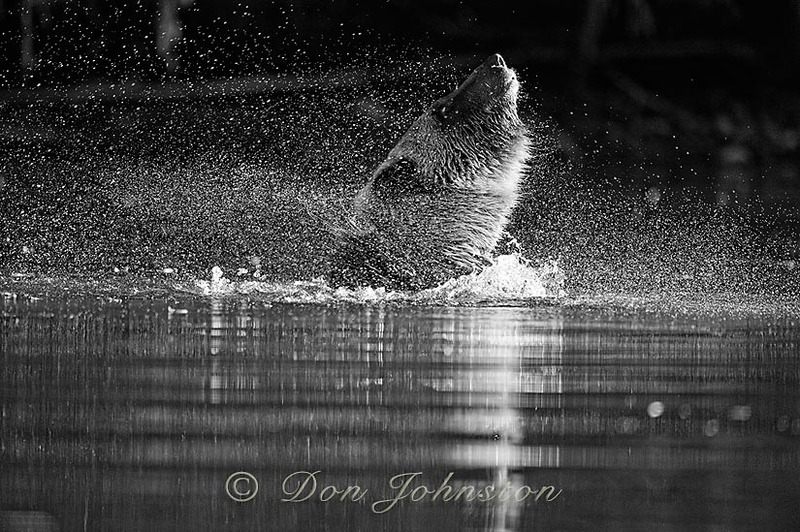 Please visit my 500px pages for a wider selection of images, including: Yellowstone animals and Yellowstone Scenics. We will be travelling west shortly so I will be taking about a month-long break from blog posting, unless I have some time and Internet access. While my first love is nature photography I will venture into the city and urban areas to make photos of other types of subjects. Sometimes I employ a version of my drive-by-shooting technique, this time on foot. Some of these urban subjects have been done a billion times and done very well. 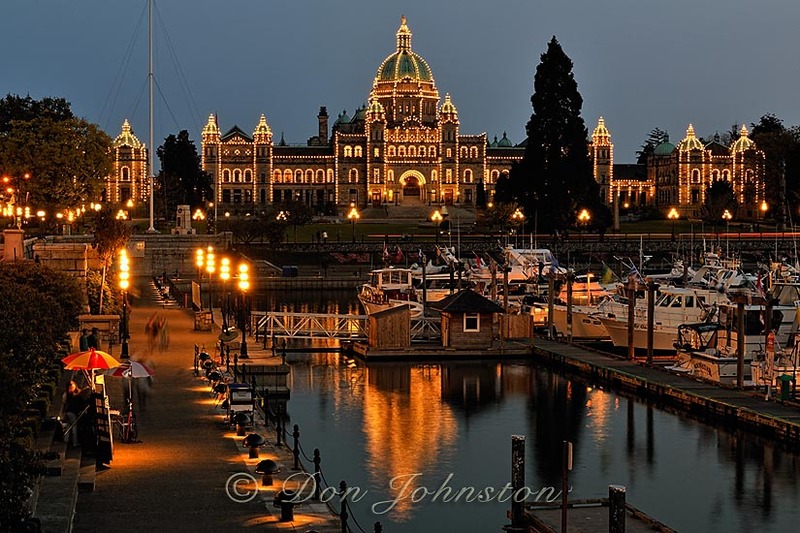 Victoria BC attracts a lot of tourists and visitors are drawn to the downtown Inner Harbour where there is an excellent view of the Provincial Parliament Buildings. One particular location, near the tourist bureau overlooks the boat basin, offering the best view of the Parliament Buildings with their lights reflected in the waters of the Inner Harbour at dusk. After photographing the traditional version of the Parliament Buildings and their reflections I decided to see what else I could do. I walked with my camera among the tourists, horse-drawn carriages, street vendors and buskers. 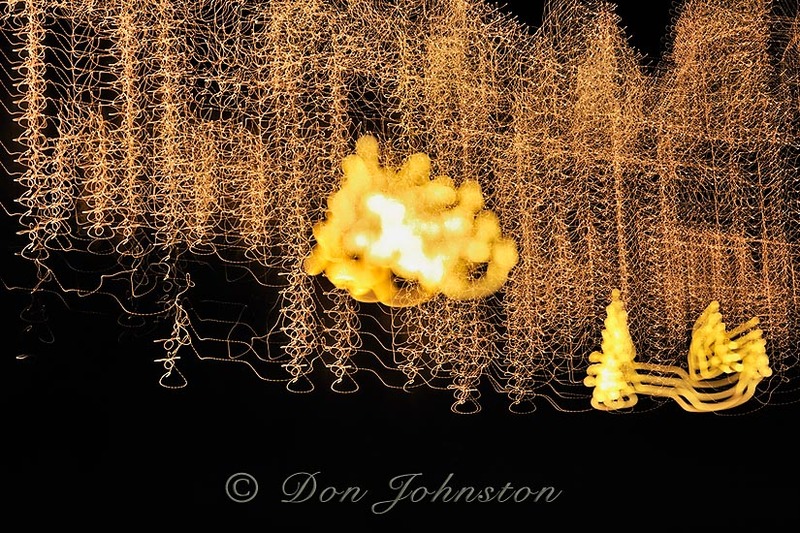 I adjusted aperture, ISO and shutter speeds to make exposures of four to eight seconds in length. I checked my histogram and review screen to see if I was in the ballpark with exposure. 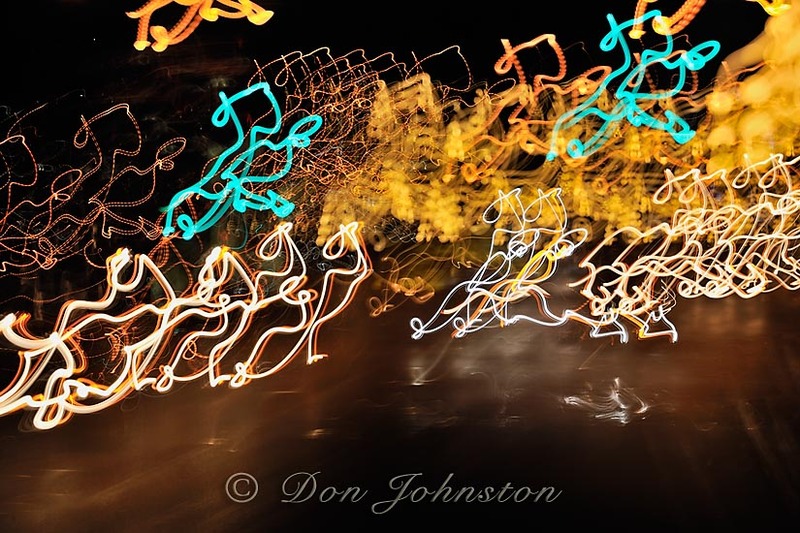 For composition, my method involves walking but keeping the camera loosely trained on one central point in the scene- say a set of lights, while I walk. I don’t put my eye to the viewfinder, I simply check the review screen to see if I have captured an interesting version of the scene. 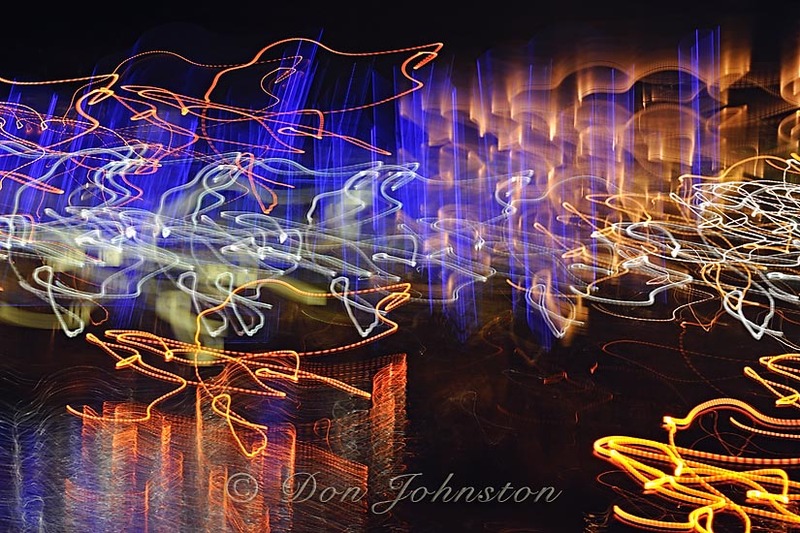 Sometimes I need to repeat an exposure, raising or lowering the camera a bit, to improve the balance of abstract lights in the capture. I don’t delete much, in-camera. I wait until I am back at the computer to eliminate the more obvious weak images. 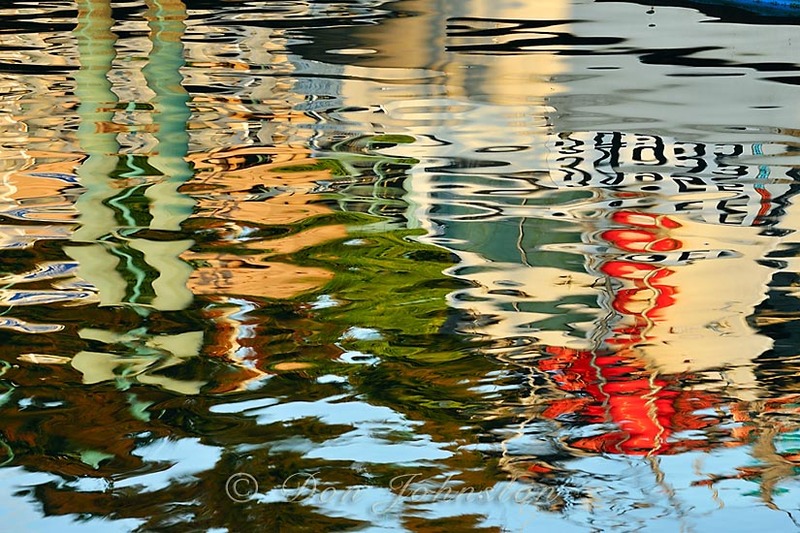 Alternatively I enjoy photographing reflections of vessels or buildings in the boat basins. The wharves are usually sturdy enough for a tripod and I am often free to wander almost anywhere. 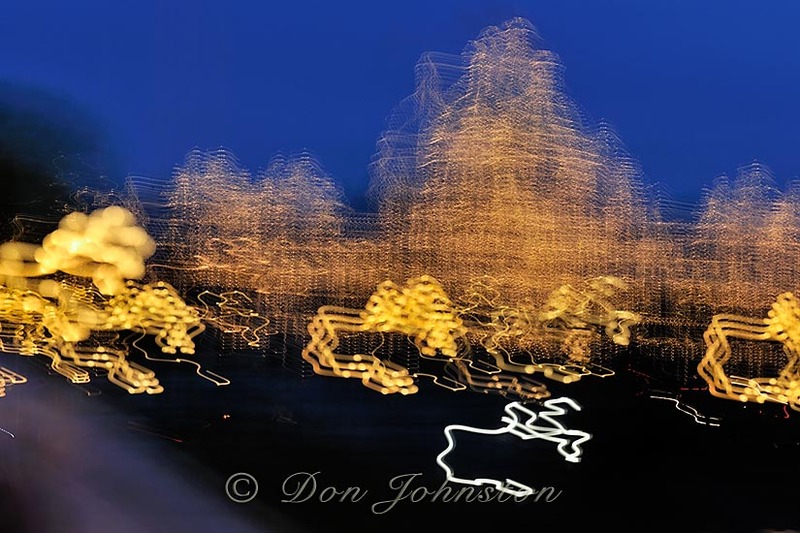 In this image, the famous Empress Hotel, warmed by evening light, is reflected in the Inner Harbour waters. The boat basin at Nanaimo BC offered me similarly exciting subject material before and after dark. Not as famous as Victoria but there were some lovely colours and exciting images created by my ‘walk-about’ technique. Night time view of the Nanaimo Boat Basin. Nanaimo BC. 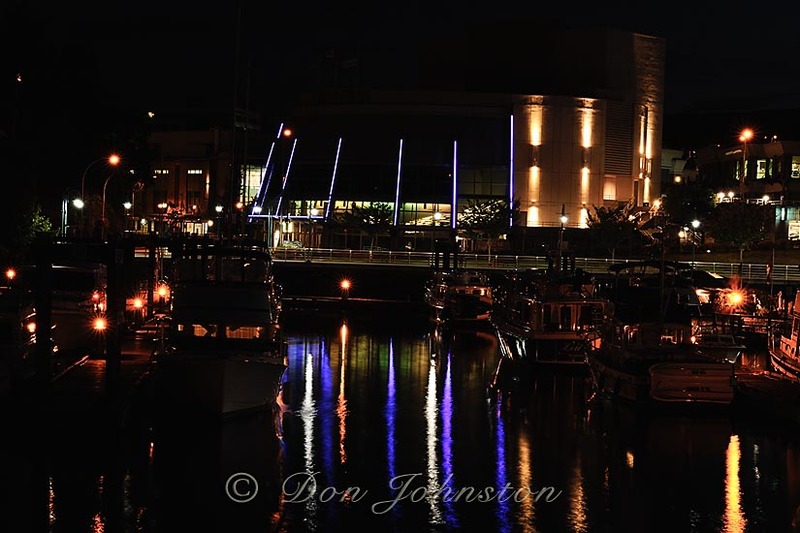 Nighttime abstract views of Nanaimo boat basin and the performing arts center. Nanaimo BC.8 sec exposure. Pedestrian bridge at night in Maffeo Sutton Park. Nanaimo BC. 5 sec exposure. 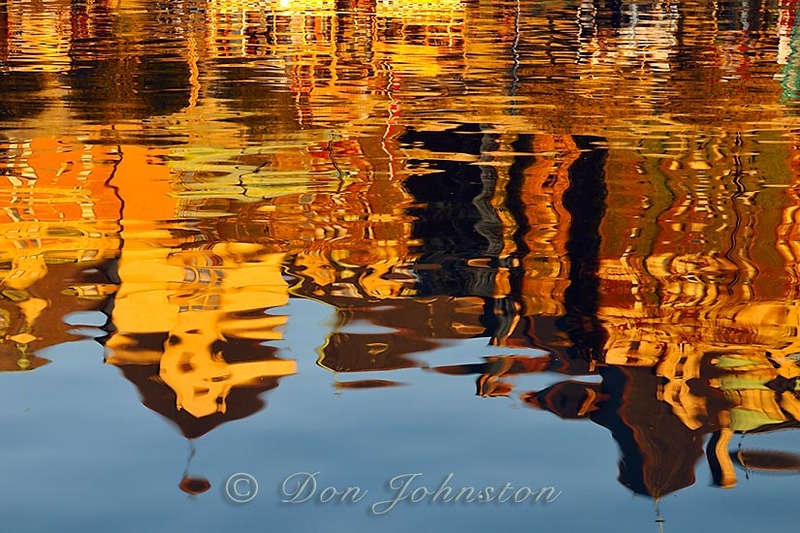 Boat and wharf reflections in Nanaimo Harbour water. Nanaimo BC.